Author Gary Niebuhr proves that mystery book club is no misnomer, and that when it comes to the mystery genre, there is indeed a great deal to talk about. He also reveals how to organize your group, get participants, select book club titles, prepare for the meeting, and conduct discussions. Everything you need is here-book club themes, inside tips, and background material, as well as provocative questions for 100 of the best mystery titles for discussion. The same questions can also serve as models for discussing countless other mysteries. A list of 50 additional mystery titles to discuss and an index conclude the work. Who says there's nothing to discuss about mysteries? Mystery readers unite-you can now read mysteries guiltlessly, and extend the pleasure through lively and informed discussions. Here is the guide for mystery book clubs. Award-winning author, librarian, and avid mystery fan Gary Niebuhr proves that mystery book club is no misnomer, and that when it comes to the mystery genre, there is indeed a great deal to talk about. He also reveals how to organize your group, get participants, select book club titles, prepare for the meeting, and conduct discussions. Book club themes, inside tips, and background material and sample questions for 100 of the best mystery titles for discussion are included-from Margaret Atwood's Blind Assassin, Dan Brown's Da Vinci Code, and James Lee Burke's Cimarron Rose to Dashiell Hammet's Maltese Falcon, Tony Hillerman's Dance Hall of the Dead, and Elizabeth Inness-Brown's Burning Marguerite. You'll find a wonderful assortment of classic and contemporary mysteries here; and the questions can easily serve as models for discussing countless other mysteries. 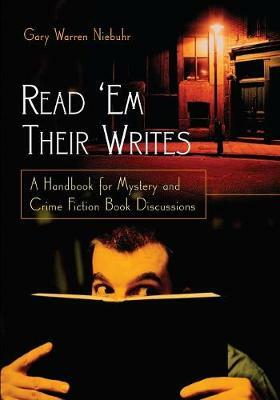 A list of 50 additional mystery titles to discuss and an index conclude the work. This is the first book club guide devoted solely to the mystery genre. Given the current popularity of mysteries and book clubs, particularly in libraries, this should be a real hit (pun intended).